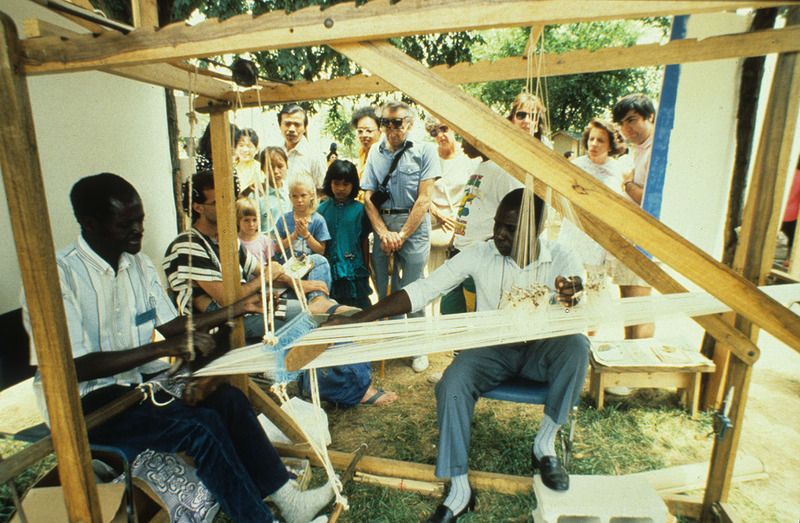 1990 Festival of American Folklife, Senegal program (91-4237). 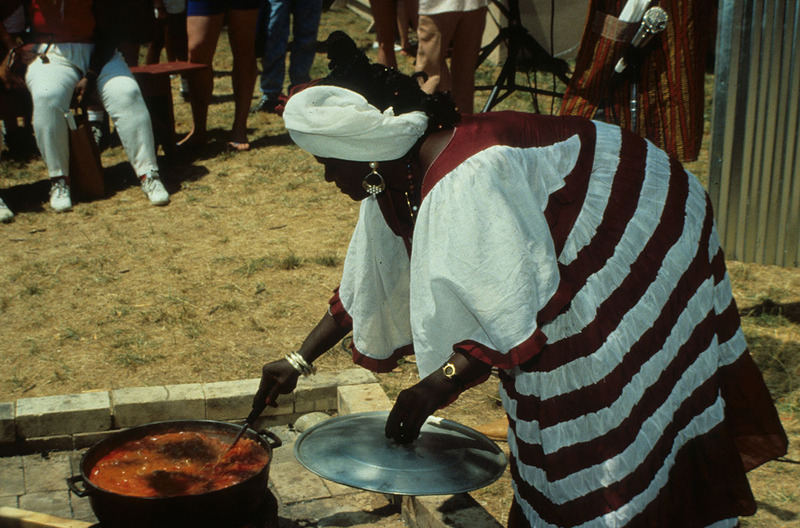 1990 Festival of American Folklife, Senegal program (91-4549). 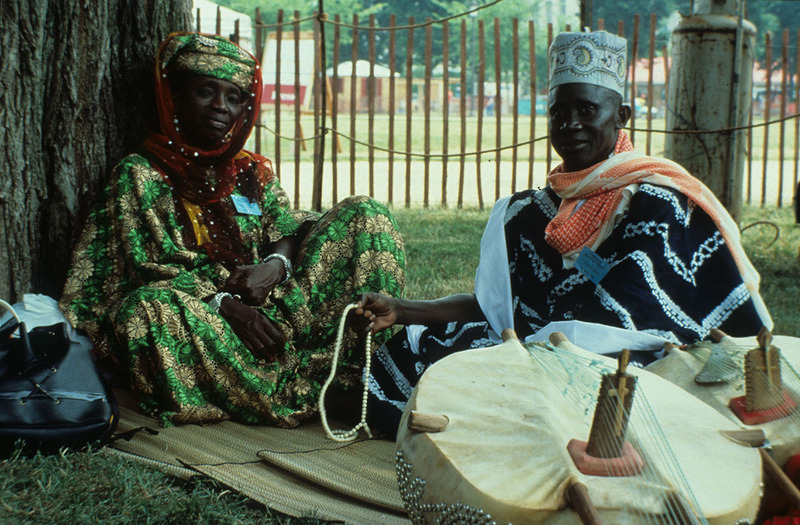 1990 Festival of American Folklife, Senegal program (91-4588). 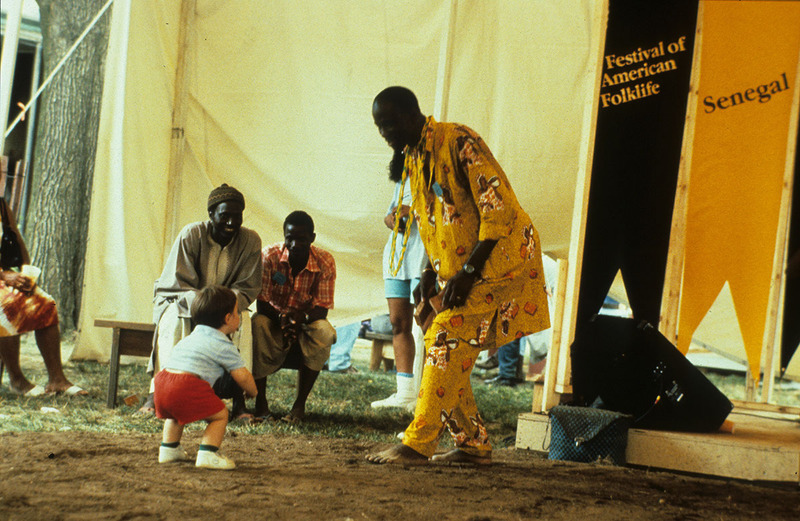 1990 Festival of American Folklife, Senegal program (91-4732). 1990 Festival of American Folklife, Senegal program (91-4970). 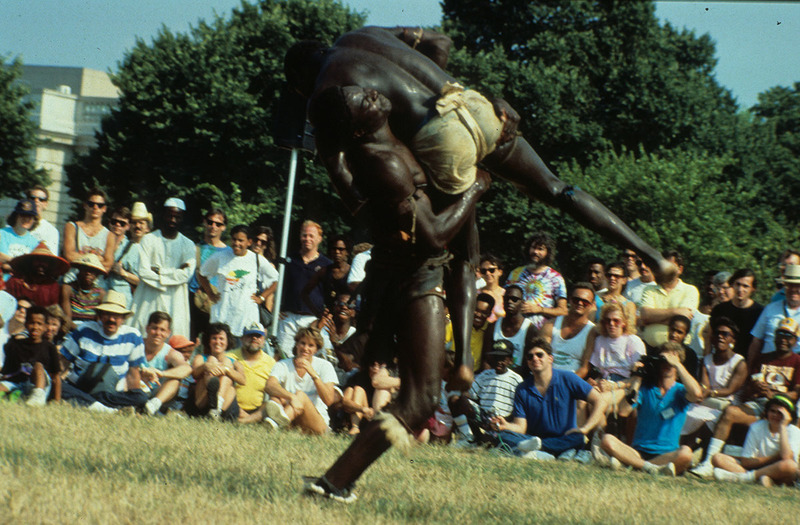 1990 Festival of American Folklife, Senegal program (91-5675). Senegal is a multi-ethnic democratic society, joined together by national institutions and traditional values deriving from Islamic, sub-Saharan African, and European sources. Traditions of praise singing, storytelling, healing, weaving, hair braiding, and metal smithing enact and promulgate ethics of social responsibility, personal integrity, and the dignity of self within a spiritual framework. Many Africans brought to the Americas in the slave trade came from Senegal and nearby coastal regions of West Africa. The cultural continuity of the African diaspora in the Americas is still evident in traditions such as spirit stilt dancing and hair braiding practiced in both Senegal and the U.S. Virgin Islands. There is a Senegalese tale about the Manding King Aboubacar II who set off westward across the Atlantic with two thousand canoes several hundred years before Columbus. Whether or not his fleet arrived is unknown. But that spirit of exploration, which also placed Senegalese in a network of trade routes through the Sahara to the Mediterranean, motivated a generation of Senegalese-American immigrants to enter U.S. universities, participate in the professional work force, and contribute to commercial and street markets in New York, Washington, D.C., and Atlanta. Visitors to the Senegal program at the Festival had an opportunity to experience some aspects of the traditional folk cultures of Senegal and to learn the ways they shape and express cultural identities in this complex African society. Cultural identities embodied in personal presentation and other forms of expressive culture were explored through crafts, music, narrative, dance, and foodways traditions performed in domestic, occupational, and festive contexts. Senegal's contribution to the culture of the Americas was also featured. 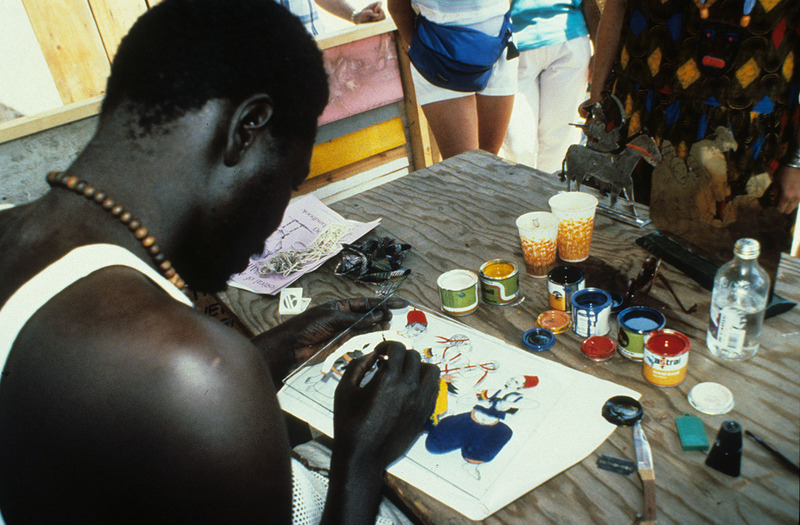 Visitors to the program often found that presentations by Senegalese Festival participants challenged their preconceived notions about African cultures, societies, and forms of traditional artistic expression. The social complexity of Senegalese society, the importance of history in everyday life, the legacy of nine centuries of empire, the impact of Islam, and the relationship of aesthetics and morality were all visible through the lens of traditional folklife. Diana N'Diaye was Curator of the program, with Barbara Lau and Gorgui N'Diaye as Program Coordinators and John Franklin, Jr. as Program Consultant. Virginia McCauley and Sokhna N'Doye served as Foodways Coordinators. The Senegal program was made possible, in part, by the President of the Republic of Senegal, Abdou Diouf, the Office of the President, the Ministry of Culture and Communication, the Ministry of Tourism and Environment, the Senegalese Embassy to the United States, the American Embassy to Senegal, the American Cultural Center in Senegal, Université Cheikh Anta Diop de Dakar - Institut Fondamental de ! 'Afrique Noire, and administrative authorities in Dakar and in the various regions of Senegal.